There really aren’t enough games about small, fluffy creatures, at least not ones about small, fluffy creatures that are actually cute and not terrifying, so it’s a good thing that Stuffed Fables has come along to fill the gap. 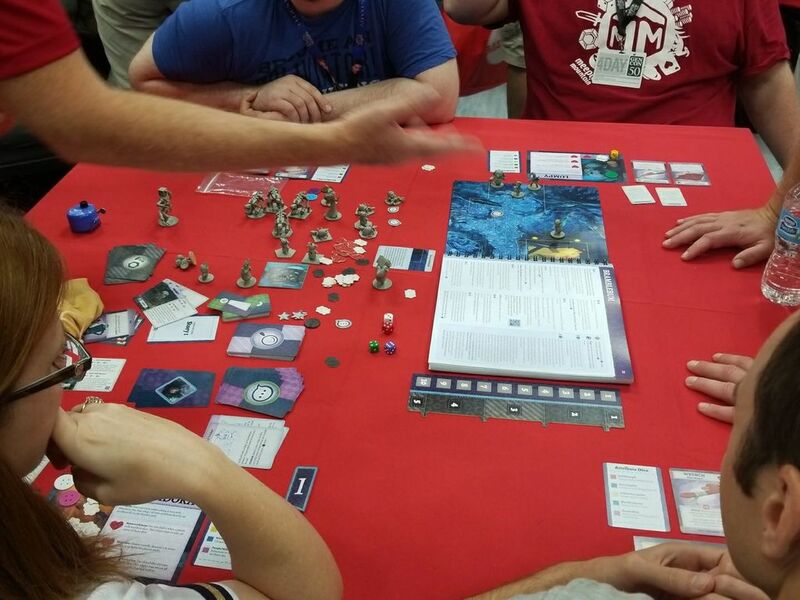 It feels like a game that the designer, Jerry Hawthorne, has been incrementally improving on. This is especially apparent if you compare it to his last game, Mice and Mystics. 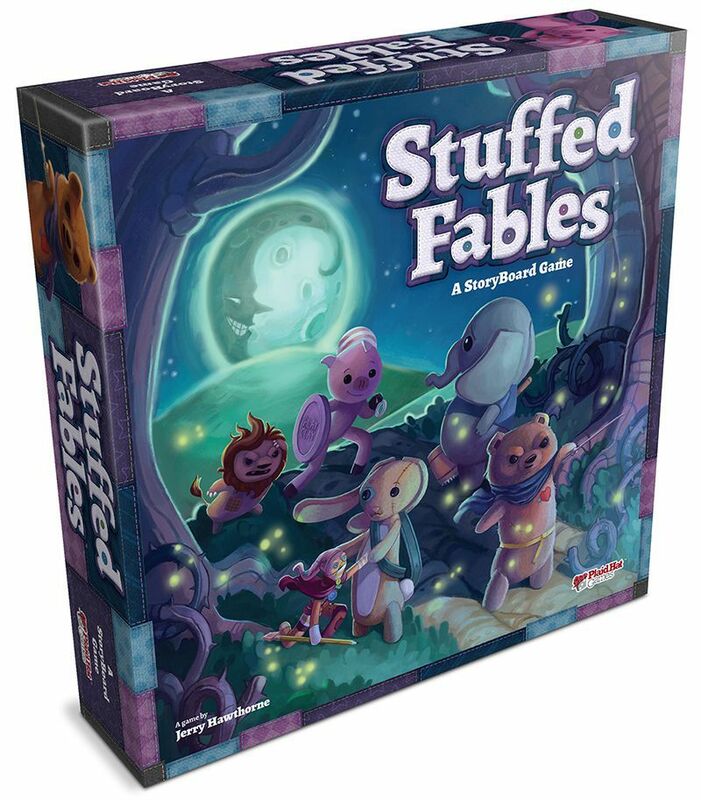 Stuffed Fables was published by Plaid Hat Games, similar to Hawthorne’s previous game, and is a figure moving, dice assigning game about a group of stuffed toys who come alive at night to defend their sleeping child. Throughout the course of several different adventures, you must do your best to protect your charge from a gang of foul creatures, as well as the trials and tribulations of moving into a big girl bed. As you can probably tell already, the story of the game takes place during the dreams of a little girl. 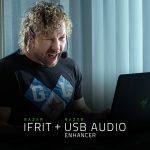 Each adventure deals with a different issue that a child might face while they’re growing up, although that doesn’t mean that the game is necessarily aimed exclusively at children. Each story ends with a section detailing the different issues that the adventure may have raised, as well as some interesting talking points for both children and adults. 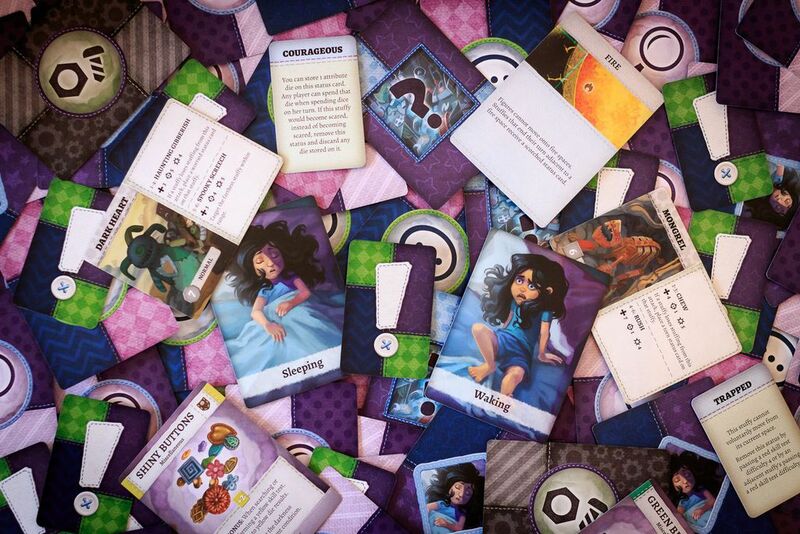 Stuffed Fables starts out with an interesting quirk behind it, namely that it doesn’t come with a board, at least not in the traditional sense. Instead, the board has been quite ingeniously combined with the adventure book, meaning that as you open a page, one half of the book acts as a board and the other half acts as the story text. This basically means that there is an impressive number of different maps without having loads of space taken up, and this also avoids the concern about board durability. 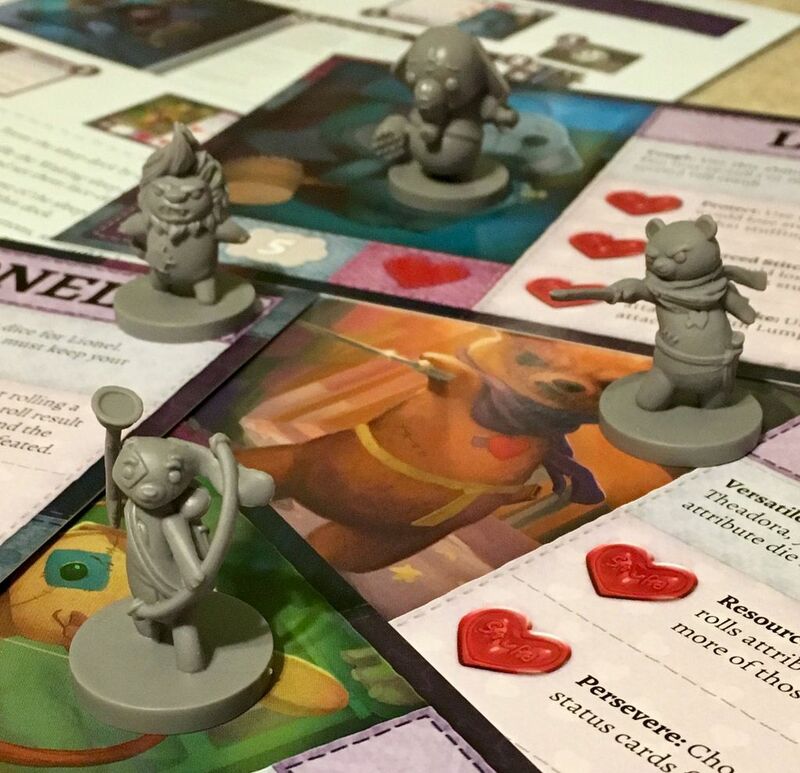 There are a certain amount of thematic similarities between Stuffed Fables and Mice and Mystics, although they don’t go all the way to the core of the gameplay. Both games are about tiny creatures in a large world and also about nebulous evil forces trying to destroy innocence and goodness. The primary difference from a theme stand point is the slightly lighter nature of Stuffed Fables. While Mice and Mystics dealt with death in a very real sense, Stuffed Fables prefers to skirt around it, mainly using terms like ‘defeated’ or ‘collapsed’ to refer to the state of opponents or players. This lighter theme has come across in the mechanics as well. There has been something of a trend where many board games try to be as brutal as possible; just ask anyone who has ever played Mansions of Madness. But Stuffed Fables avoids the temptation to ramp up the difficulty. It’s quite easy to succeed in the game, partially because even when things go wrong, it is rarely an automatic game over. When you lose your health (stuffing), your character becomes incapacitated and must be regain their life either with help from another player or by performing a health-gaining action. The general gist of the gameplay is pulling a handful of 5 differently coloured dice out of a bag, with each different coloured die having different tasks associated with it, and you have to roll and use the different die accordingly. 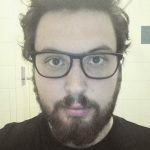 Most of the strategy in the game comes form choosing how to spend your dice, considering that movement can be done using any dice colour, and since most of the time you’re having to decide between moving around as quickly as possible and choosing when to find new items or pursue certain map objectives. For the most part, the game plays like a dungeon-crawling RPG, albeit minus the crushing difficulty and overt complexity. Your characters have health stats, different special abilities and can equip a variety of weapons, armour and accessories. While there is no levelling up, really, there is a cool legacy-esque element where new items are added to the game as you discover them throughout the story. 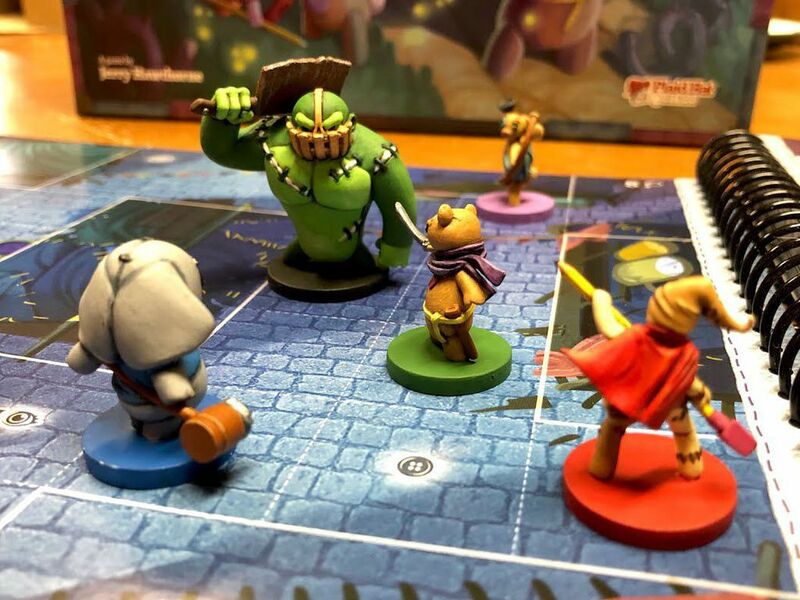 The simplicity of the game makes it nice and easy to pick up and put down, and of course, this means that you can use it to introduce your young family members to the world of tabletop gaming. There are several different characters to choose from, although you don’t have access to all of them at first. Each of the characters is a different stuffed toy, and each character has their own distinct story personalities and character designs. It speaks to the great writing that the characters are all memorable and that they all actually feel like different beings with different ‘character voices’. There’s the old hard-bitten toy who’s been passed down through the family, the jumpy and hyper rabbit, the heroic leader and the cowardly but muscular elephant. While some of the characters may seem like tropes or cliches, they all manage to work in the context of the game considering that these are very possibly the sorts of personalities that a small child might attach to their different toys. The artwork is another stand out. While it may not approach the technical accomplishments of the artwork in a lot of other games, it has its own distinct art style that in many ways is more impressive than many other games out there. While the tone of the game’s story is very light, the colour palette of the game has a lot of dark hues: deep purples, dark blues. It all feels very fitting for a game that takes places almost exclusively at night time. The models and general manufacturing are also pretty top notch in Stuffed Fables. The book that contains all of the story and maps is produced on glossy paper and doesn’t seem to bend easily or have any noticeable misprints; furthermore, the cards are all nicely printed, and the models are completely fantastic. If you’re aware of the reputation for Games Workshop figures to be over-designed, then these figurines are the complete opposite of that. Each one of them has just the right amount of detail, and they’re all immediately separable at viewing range. It really does feel like Stuffed Fables is a game that has benefited from the lessons learnt from previous projects. There is a decent amount of length to the campaign, the gameplay cracks have been filled in since Mice and Mystics, and in general everything feels more polished. While the game is a little easy, that doesn’t make it less fun, it’s just less challenging. If you’re planning on picking up the game, you should be prepared for more of a cakewalk than an uphill struggle, but you can at least expect a great experience. Stuffed Fables feels like the game that Mice and Mystics was trying be, albeit with some slight tonal differences. While the audience is a little younger than before, and the difficulty has been considerably stepped down, the game manages to present one of the most interesting storybook-style experiences out there. The master stroke of combining the story booklet and the board is something that more games definitely need to consider doing, and hopefully they will do so in the future now that this game has managed to open the flood gates.